Wounded war veterans' North Pole attempt Jump to media player Prince Harry is to join four wounded British Army veterans when they attempt to ski to the North Pole in April. 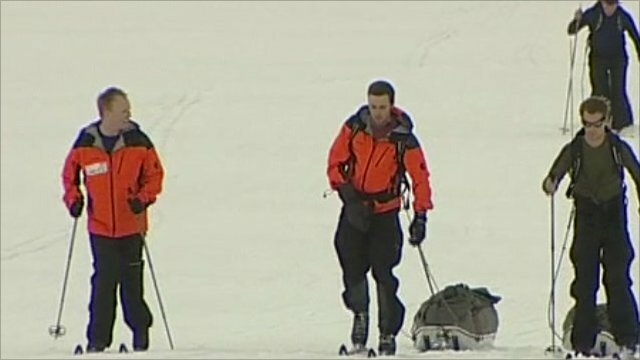 Injured soldiers head for ice cap Jump to media player A group of Afghanistan veterans who have had limbs amputated will be joined by Prince Harry on a trek to the North Pole. Kate Middleton at friend's wedding Jump to media player Kate Middleton appeared alongside several members of the Royal Family to attend the wedding of Harry Aubrey-Fletcher and Louise Stourton in Aldborough, North Yorkshire. Prince Harry is to join four wounded British Army veterans when they attempt to ski to the North Pole in April. The team will embark on a four-week, 200 mile (320km) trek from Siberia across the polar ice cap in aid of the charity Walking with the Wounded. The prince, who is patron of the charity, is planning to join the team for part of the trek, and has been working on his fitness. Each man will pull sleds weighing more than 100kg in temperatures varying between -15C to -50C (5F to -58F). The BBC's Frank Gardner, who accompanied the team on a practice trip to the Arctic last year, spoke to two of the participants Guy Disney and Guy van Gass.